As you know I like my greens, although I probably drink more than I eat. If I have a lot of greens in my smoothie, I tend to go for other veg in my evening meal. It's all about eating the rainbow, isn't it? I wish I'd been back in the swing of drinking my daily green smoothies and eating more vegetable since I got back from holiday. If I had, I probably wouldn't have this rather nasty chest infection. 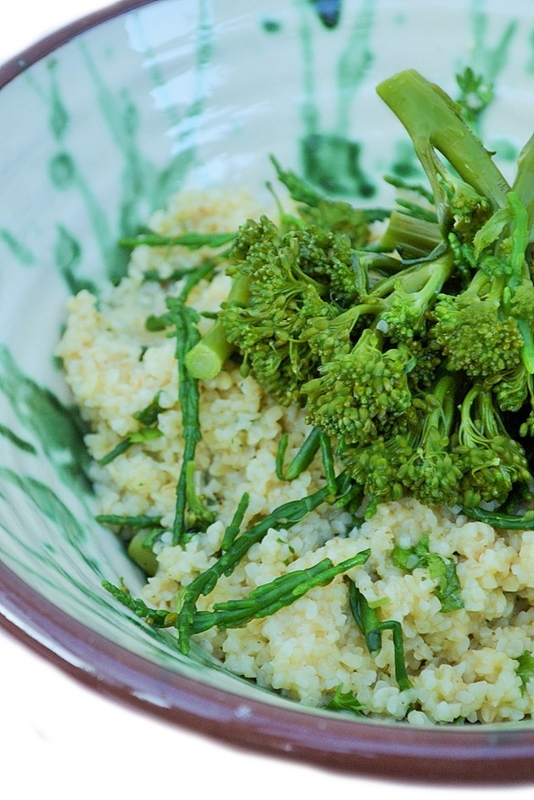 In a bid to get back on track I made this flavourful warm tenderstem and samphire bulgur salad. Broccoli was too heavy for this dish, but tenderstem was just what I was looking for and I teamed it with samphire as Cooper decided he loved the stuff when we were dining at The Gate restaurant. I like to follow up any new foodies discoveries or new likes with more of it so Cooper will remember it and I can remind him that he likes it. Yes, I have a strategy! He wasn't too impressed. He groaned and grumbled and asked where his real meal was. Surely this was a starter? In the end, he ate about a third of it so I was delighted. That was definitely a win. Graham and I happily chomped through ours. It was super tasty with the herbs, tenderstem and samphire. I added stock to the bulgur wheat for extra flavour and mixed through lemon juice, olive oil and a good grinding of black pepper. Oh yeah, it was a flavour sensation. Great textures too. Did you know that Tenderstem was developed in Japan? Using classic plant-blending techniques, they crossed broccoli with Chinese kale, so today we have these delicious stalks of mini broccoli with tender stems. 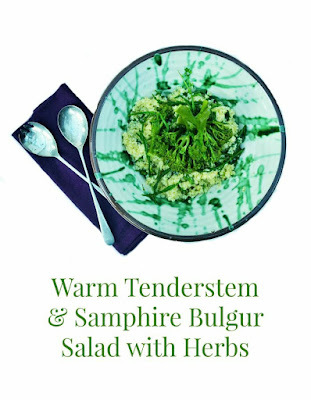 A warm grain salad with a herby lemon dressing, mixed through herbs and samphire and topped with tasty tenderstem. 1. Gently simmer the bulgur wheat in the vegetable stock for 10 minutes, then turn of the heat and leave to stand for another 10 to 15 minutes until the liquid is absorbed and the bulgur is tender. Fluff it up with a fork.2. 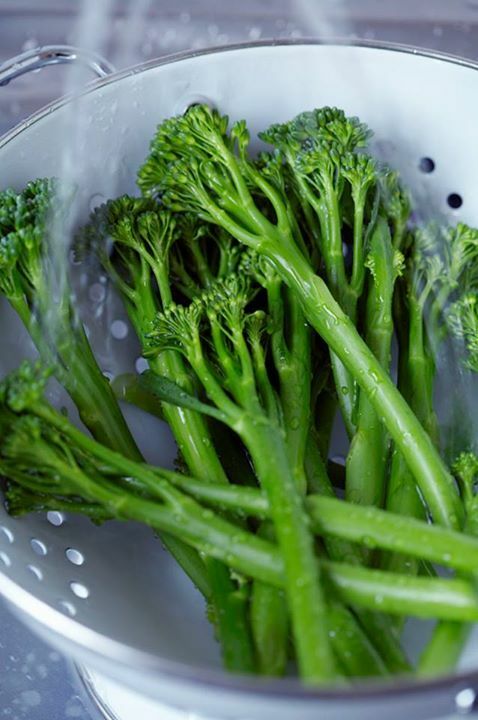 Boil or steam the tenderstem for a few minutes, adding the samphire towards the end.3. Set aside some of the tenderstem to top the bowls with, then miix through the rest of the vegetables, herbs and dressing.4. Season with black pepper and serve topped with the reserved tenderstem. 5. Serve and enjoy.Notes: This is a great meal on it's own, but if you feel you would like to bulk it out, why not serve it with spiced sweet potato wedges or some crusty bread. Disclosure: I was paid to develop a recipe using Tenderstem. I was not expected to write a positive review and any opinions expressed are my own. Thanks Roz, it was really good and you're right about tenderstem. Looks very tasty, Jac. You do so well to get Cooper to eat all these different foods, it is always a challenge with some children more than others! Well I am afraid he is a challenge too Janice. He's a work in progress. I so just want to reach in for a bite Jac. I love tenderstem but just don't have it enough. No either do I, but now I have a taste for it again. I definitely prefer it to broccoli. No that was news to me too and yes I'm sure you'd enjoy this. Well at least he tried it after all his grumbling which was something Johanna. It's always reassuring to hear I'm not the only mum struggling to get their wee ones to try new things. I know what you mean, I tend to put it on the side too. It deserves so much more. It really goes well with the Tenderstem. What a lovely salad Jacqueline - I have not cooked with Samphire much - just had it in restaurants, but an interesting use of this sea vegetable. A superfood meal in lots of ways. Love tender stem broccoli, usually I grill mine, but this looks super. Thanks Nazima. Grilled tenderstem, oh now I never grill mine, I'll have to give that a go. Mmm a lovely simple dish perfect to showcase these fantastic ingredients! Yum! Thanks Elizabeth, I really enjoyed it.